This is a heavily edited version of an essay I wrote some time ago, which for some reason I’ve suddenly thought might be kinda relevant. While I’ve tried to chop out lots of boring bits, it’s still fairly dull, however there may be at least one or two interesting points hidden in there. This analysis compares two different news accounts of the same event in order to determine how / whether each narrative’s features reflect and contribute to the shaping of norms, values and perspectives in relation to both news consumption and production. The narrative event is the Japanese earthquake and tsunami of March 2011. In this essay ‘Traditional’ media and journalism refers to those methods indicative of print based newspapers and television, along with their online incarnations. ‘New Media’ on the other hand refers to relatively recent web developments such as blogging, micro-blogging and social media networking, which are largely used as independent or self publishing platforms. The New York Times like many newspapers across the world it is in a period of transition. It is not clear what the newspaper is transitioning into, but it clear that the traditional news media is heavily investing in an online presence. Bill Keller, the NYT editor described in a 2009 presentation how the parent company “has to be, a technology company as well as a journalism company.” (Keller quoted by NiemanJournalismLab, 2009) Keller also listed a number of challenges facing traditional newspapers, highlighting the need to integrate social media, to consider how content is presented in terms of “web first”, to make these concepts integral to the way the newsroom itself operates and, fundamentally, to make the article not simply a report on an event, but “an engine of engagement”, a door through which readers reach other content. These comments suggest a media which is facing continual challenges to keep up with technological advancements, requiring continual institutional and industry wide evolution. The Storyful ‘App’ or online application (which the creators call a “storybuilding tool”) provides the software for web users to create and share stories. Storyful stories can be thought of as narratives weaved of disparate texts (video, audio and text), created by different people, in different locations, in different time zones. These texts are integrated using the web tools to produce a news narrative. The stories can be compiled and uploaded from phones, laptops and computers – from any location with mobile or wifi connections. As a New Media application it is both a tool and a challenge, it provides users, potential “citizen journalists”, with the tools to create news, and it also challenges them to articulate their own journalistic voice. (Willis and Bowman, 2003: 9) This is not to say though that Storyful is entirely committed to new ways of telling stories, through the promotion of certain stories via the “Curator’s Choice” and the foregrounding of Storyful’s “professional” journalists stories the organisation illustrates “what counts as successful performance and provid[es] guidelines for participants” to be part of the “Community”. (Lankshear and Knobel, 2007: 18) However it does pose questions about how this might change the way we write, who we interact with, and ultimately who we are interacting with through our texts. Bell and Garrett observed that texts “reflect the technology that is available for producing them” (Bell and Garrett, 1998: 3), with this in mind, it may be instructive to look at the different tools each publication utilises to construct their narratives. Some of the features of new media which are employed by both traditional and new media journalism are, as mentioned in the introduction, blogging, micro-blogging and social media platforms. Blogging is form of self publishing, provided free by many organisations, that allows users with access to a computer and internet connection, to create, modify and personalise an online space in which they can publish content in a loose diary form, with the most recent entries appearing at the top of the web page. These entries can contain text, embedded video, images and audio as well as allowing hyperlinking and commenting facilities. Twitter is a relatively recent innovation in online publishing, it fills a space somewhere between blogging and social networking sites like Facebook. It provides users (again on a free basis) with an application that allows them to publish entries or “tweets” of up to 140 characters in length. These tweets are published to the web, they are also directly visible in the twitter “streams” of a) those people who network or “follow” the user and b) those other users monitoring “trending” topics via the use of “hashtags” (aggregates of trending topics specified by the user). Social media platforms including Facebook and MySpace, provide users with a web “space”, a webpage which can be personalised and accessed by the user and their friends and acquaintances. Both traditional and social media news make use of several of these different web based self-publishing platforms, but to differing extents. Storyful is almost entirely driven by New Media forms, whereas the NYT is primarily based on Traditional forms, integrating new forms only as a means to compliment the main text. Storyful articles make use of an intricate web of referencing, where each sub text element of the overall story is directly attributed to a source. Unlike traditional media stories where the use of referencing and / or links to outside content is restricted (and qualified by the use of legalistic sounding footnotes rejecting any responsibility for linked content), linking is integral to Storyful. In some sense its authority is derived from its links. Whereas Traditional news sources derive their authority from an institutional history of reliable news reporting, its industry standing and associations with other broadcasting organisations, as well as the extent to which their reports are syndicated and referenced by other news organisations. This single Storyful article on the Japan earthquake and the following events integrates numerous links to sources uploaded to separate places on the internet, linking different users of different applications into one text. There are links to web applications providing blogging, micro-blogging, video hosting, image hosting and map functionality tools, such as Twitter, TwitPic, YouTube, Google Maps, yFrog, as well as references to traditional media sources such as ‘Tokyo’s Time Out magazine’. These internet locations also reference in turn to traditional media texts from organisations such as Al Jazzera and Japanese TV News. This ability to integrate references to other sources allows narrators (or curators) to use other voices to tell their story for them. However, referencing, linking and attributing of sources also exposes the transient nature of social media constructed news. It is temporary, links are broken, their content inaccessible, leaving a link in the narrative chain missing. For example two of the YouTube videos embedded into the report in the first entry alone are now listed as “Removed by the user”. While this occurs to some extent in any web medium, it is, with the Traditional media tempered by legal requirements relating to copyright etc. The New York Times integration of other mediums by contrast, such as hyper-linking to related content, photos and video, physically frame the report. They are therefore depicted as peripheral to the main narrative contained in the text. The relative size of photos and videos also denotes their importance to the story telling. They are just large enough so as to allow readers to infer their likely content, but small enough so as to allow the text to dominate the webpage space. When video and image links are selected they open a new ‘window’ outside the main narrative. The most prominent use of different media in the traditional news story is the use of photos and images. Most prominent news stories are framed by an image. This image foregrounds a particular perspective on the event being reported. In the case of the New York Times, the image shows a person standing on flooded road, which is covered in debris, looking out over a scene of apparent destruction. However, even in this token use, the phrasing and word choice seem clumsy, there is little use of popular social media jargon, such as “handle” or “user name” to describe the source, instead the writer(s) opt for the convoluted “who used the name”, suggesting a degree of caution, a suspicion it is not the users actual name, or simply an unfamiliarity with the “in-group” lexicon of the medium. The second explanation appears less likely given that the New York Times has its own Twitter account, along with many of its journalists and columnists. Therefore choice not to use Twitter language and the positioning of the text in the closing paragraphs appears to serve as a means of distancing social media from Traditional news. As with spoken language, written texts incorporate the use of many different voices. This process in journalism serves a very similar function as that in speech. Just as Janet Maybin describes how “reproducing the voices of different characters, children can briefly take on and try out that character’s viewpoint”, so too do journalists take on the perspectives of those sources they choose to quote. (Maybin, 1996: 38) The new literacy practices enabled by web based applications, used to differing extents by both the Traditional and New Media, provide an insight into the different perspectives journalists and news curators choose to take on. One of the most prominent features of New Media stories such as those of Storyful is the use of sources such as Twitter. In contrast to traditional journalism Storyful does not mediate quotes from sources with “claims” or “says”, the voice is directly embedded in the text. This negates to some extent the ability of the author to impart a judgement by way of a qualifying phrase. While the choice of quotation and how it is framed by the remainder of the text is still open to manipulation, the quotation itself exists as an entity. While this does lend a degree of impartiality to the use of quotations, it also rejects traditional concepts of official statements as conversations, they reduce the ability of the journalist to ask the questions. The variety of voices used in each report is interesting, Storyful includes a number of clearly identifiable Traditional news sources such as “Tokyo Time Out” and “CNN journalist Kyung Lah”, a number of the social media sources are also essentially second hand Traditional news sources, in that the users have uploaded footage from television news on to video hosting sites such as YouTube. However, there is much original eyewitness content, with a video depicting destroyed buildings provided by “fmyukiguni” and footage of a section of roadway sheared by the force of the earthquake provided by “mappan777”, as well as eyewitness commentary provided by Japan resident Twitter users such as “hikosaemon” and “jt_sloosh”. Traditional media voices are primarily officials, with government, media and state institution representatives voices making up the majority of those cited. Among those referenced are “the JR rail company”, “Japanese officials”, “a newspaper, the Mainichi Shimbun”, “TV Asahi”, “a reporter at TV Asahi”, and “Prime Minister Naoto Kan”. Eye-witness sources from social media and local interviews are used sparingly, with only two in the entire report: “Fumiaki Yamato”, “On Twitter, a person who used the name sinonosama”. In order to demonstrate the potential effects of choosing particular voices in may be useful to make a comparison. When earthquakes and tsunamis hit Haiti and Southeast Asia (in 2010 and 2004 respectively) the rescue and rebuilding plans were immediately described as the responsibility of the “international community”. In reports on Haiti, Haitian officials were conspicuous by their absence, with American (United States) officials dominating reports. (Romero and Lacey, 2010) Haitians were reported to be panicked by the earthquake, they were, according to one eye-witness, “totally freaked out and shaken”. In Southeast Asia “[a] hotel worker reached by telephone was too frightened to talk.” (New York Times, 2004) In Japan by contrast the content and structure of the report suggests a degree of orderliness. Despite the “roar and rumble of the temblor, shaking skyscrapers, toppling furniture and buckling highways” there are no eye-witness accounts of fearful people, instead readers are told “the public is among the best educated in the world about earthquakes and tsunamis.” This is reflected again in the Storyful report, where the first line of the report reveals “Japanese sense of efficiency prevails”. The choice and use of sources in the construction of the news narratives in both instances is instructive. Both accounts display a clear hierarchy of value with regard to sources. Public sources, in the shape of eyewitness testimony, are used primarily to evoke a personal account of events, whereas official sources describe the ‘big picture’, they provide information and comment on future events, such as how rescue efforts will proceed. These industry pressures have evolved a predominant writing style, dubbed the “inverted pyramid” (Refer to Figure 1) (Faure, 2001: 358). 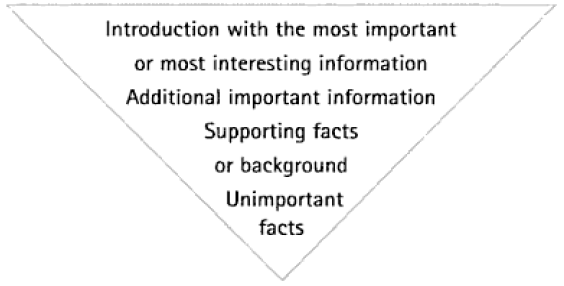 The inverted pyramid, shown below, depicts how information should be arranged in a news report. Important information is positioned at the beginning of the report, followed by further less critical information and information of interest, with background information and other unimportant facts placed at the end of the report. Bell notes that this structure, dictated by “news value”, upsets the natural or chronological order of events. (Bell, 1998:97) As we will see, this structure can be seen in operation in both the traditional news report and to a lesser extent in the new media report. The New York Times report is an example of “hard news”, in that it is presented as a factual, unmediated account of an event, including only the most important and salient facts. It differs in this regard from what are called “soft news” stories, which are said to focus on “human interest angles”, which include to a greater degree other non-essential background information. (Fulton, 2005: 226) The most prominent narrative feature of “hard news” stories is the positioning of the writer as a third-person narrator. (Fulton, 2005: 232) The writer comments on events, their voice is not visible. For example, answers to apparent questions are reported, but not the questions themselves. The NYT article was published on Friday 11 March 2011 (the earthquake struck Japan at 2:46 pm on the same day), although it is difficult to determine the exact time. However, given the article mentions events on Saturday morning it was likely published sometime on Friday evening, taking into account the 13 hour time difference between New York and Tokyo. This sequence of events is important, as we will see, because it contributes to the way in which the story is presented. Once recounting the story is complete, the report returns to the present, with interviews with local people and news of transport disruptions. The report then evolves into a technical discussion of earthquake severity, how tsunamis are formed, with some details on effects felt at a US local level, as would be expected from the “inverted pyramid” model. As with the NYT article, the Storyful article also depicts a rescue effort, the opening lines of its first entry providing information about free accommodation and food in Tokyo. However, the prominent presentation of videos and images depicting the destruction caused by the earthquake and tsunami is suggestive of a documentation of the event as a seismic activity, as an object in motion. With the wave as the principal actor. Storyful timelines are far more linear than those of Traditional media reports. The timelines are disjointed, with new entries appearing visually stacked one on top of the other. Each entry is a linear narrative constructed from a starting point continuing downwards on the webpage. This reflects to some degree older forms of journalistic narratives, where reports followed a strict chronological order. (Bell, 1998: 97)The effect of this timeline structure is interesting in that it reflects the same confusion and difficulty to foresee consequences that those who experienced the event first hand would have encountered. Which contrasts with the third-person narrative of Traditional reports where the journalist appears omnipotent. For example, ‘Long Pause for Japanese Industry Raises Concerns About Supply Chain’, published in the business section of the New York Times five days after the earthquake frames the story as a disruption for Japanese industries and foreign importers. (Powell, 2011) The report goes on to highlight potential opportunities for home industries in the face of Japanese production and supply difficulties. The two thumbnail size photographic images accompanying the article depict a port area, where a vessel has run aground, and an image of several cars crushed against each other, signalling the extent of physical damage to export / import infrastructure. Government plans to prevent further human casualties (which as yet go unmentioned in the report) by forcing the moving of people outside a buffer zone around the damaged nuclear reactors is described as a “distraction” for companies. Another article, ‘Crises in Japan Ripple Across the Global Economy’, published ten days after the earthquake struck. (Jolly, 2011) Japan’s “cascading disasters” are framed as a cause of financial loss, potentially weakening the US economy. “The human face of [the] disaster” appears only towards the end of the article, where it was presented as a logistical problem for employers. With employees having to be evacuated and supplier operations therefore left understaffed. In contrast to traditional stories, where past reports are aggregated into each current report, Storyful stories are timelines, stretching from a present backwards (or physically downwards on the webpage) towards an origin. Therefore, much like diary entries, the story of Japan’s earthquake, tsunami, nuclear disaster is presented as a lived experience. Storyful’s news narrative also challenges the Traditional model of the mediated release of information, it reveals information just as it is received by the journalist, it is for writer and reader alike a mutual learning curve, where the reader is essentially witness to the unfolding narrative. Traditional reporting on the other hand is concerned with centralising knowledge and controlling the flow of information. While the articles present and foreground different modalities and voices, they can be seen to align with those accounts provided by officials. This reflects journalistic ideology at an institutional level. “ @media_bite You just look foolish by spamming @petersbeaumont, who knows vastly more on foreign affairs than genocide-deniers of @medialens. “ @media_bite I don’t know about “understandable” – why not just acknowledge changes, seeing as people would notice them? “ @ejhchess @media_bite I don’t work for Guardian/Observer: I just note bleak joke in demand for correction from org that denies Srebrenica. “ @OliverKamm @ejhchess I have no idea wht youre on about Oliver. What organisation? Demanding what correction? U work for Murdoch I thought? A selection of reactions from journalists on Twitter. “ If this is a car bomb then it will have been carefully planned and unlikely to be one person ‘inspired’ to act alone. Al Qaeda seems likely. “ If reports of shooting at youth camp after bomb in Oslo are true, this could be a version of the ‘Mumbai style’ attack that had been feared. “ Oslo explostion – possible motive if a bomb; Norway has about 500 soldiers in Afghanistan with Nato-led coalition. “ Earlier this month, Norwegian police held 3 people in al Qaeda bomb plot. “ BBC commentator speculates that terrorists might confuse Scandinavian countries. “ Norway blast – working assumption is it was a bomb but not confirmed. AQ’s AlZawahiri threatened Norway in 2007. “ Sorry, have I missed something? What has #Norway ever done to anyone other than inflict the lead singer of Aqua on the world? Shocked. “ @NikDarlington participating in ISAF from the beginning and a Norwegian newspaper re-printing the Danish cartoons, mostly. “ @afneil Yes, but legitimate to raise links between radical Islamist & neo-Nazi groups, and common support for 9/11. Consider Horst Mahler. “ If terrorism, perhaps the government of Norway will finally rid itself of Mullah Krekar. There’ s no need for comment. It speaks for itself.